Through a series of mistaken identities Buster winds up with a load of furniture in the middle of a parade of policemen. An anarchist's bomb lands in his carriage. After lighting his cigarette with it, he tosses it into the ranks of the police. When it explodes the police chase him all over town. 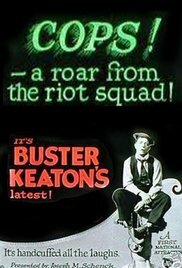 Cops is a 1922 comedy short silent film about a young man who accidentally gets on the bad side of the entire Los Angeles Police Department during a parade, and is chased all over town. It was written and directed by Edward F. Cline and Keaton.